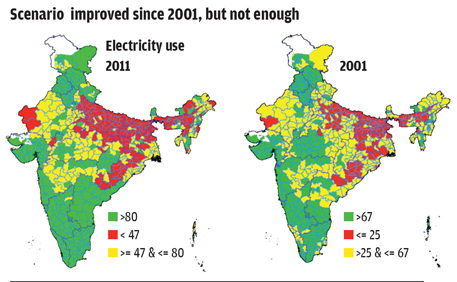 The census data of 2001 and 2011 are good indicators of energy use in the country. The data shows that Indians use firewood, crop residue, cow dung cake, kerosene, LPG and coal—lignite, charcoal biogas— as fuel sources. 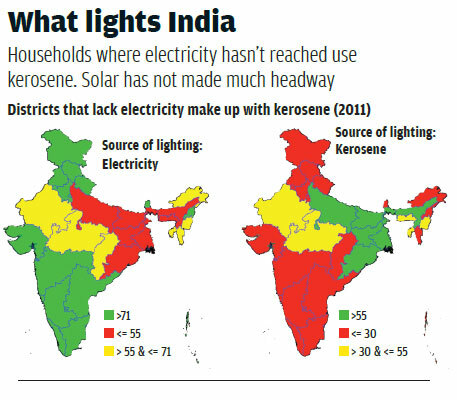 Electricity, followed by kerosene, fulfils lighting needs of most households in the country. Other sources, including solar light, account for a very small fraction. The census data also categorises households as “No lighting”. But this category is very small numerically— ideally, it should have been near zero. The pattern becomes sharper once we look at the district-level in the next set of maps (see ‘Scenario improved since 2001, but not enough’ ). The map on the left depicts the cluster of districts by percentage of households using electricity as a source of lighting. In a large segment of districts shown in green, electricity is the main source of lighting for more than 80 per cent of the households. But in another compact cluster, shown in red, less than 47 per cent households have such access. As any discerning reader would realise, this is quite the same cluster where more than 47 per cent households use kerosene as the major source of lighting. The map on the right in this set is somewhat similar. The latter map depicts the situation in 2001 but here districts shown in green are the ones where electricity is a major source of lighting in more than 67 per cent households. What is more interesting is the compact cluster shown in red where such access was available to less than 25 per cent households. The two maps tell us that the situation has no doubt improved since 2001 but the cluster of the deprived districts has remained more or less the same. This is a repeatedly recurring pattern; while the levels of deprivation decrease, the locus of deprivation endures far more strongly. This is a serious challenge to policy makers, planners, programme implementers, researchers and activists alike. 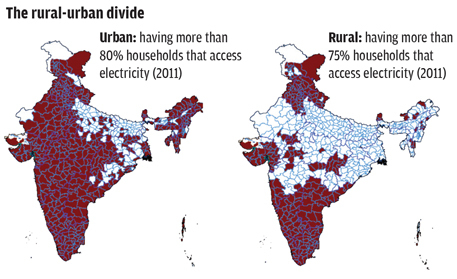 How do urban and the rural segments compare with regard to access to electricity for lighting? For that we turn to the third set of maps (see ‘Rural-urban divide’). The map on the left shows that a very large part of the urban landscape has more than 80 per cent households that access electricity as a major source of lighting. But the map on the right reveals the rural reality where a far smaller set of districts can boast of 75 per cent or more households having such an access. It would appear logical that solar energy should have made a much stronger headway in the region where kerosene has been used for lighting. But that does not seem to have happened (see ‘Solar has not stepped in to replace kerosene’). One can no doubt see a sizeable cluster of districts in rural area where solar energy is used for lighting. But this cluster shows up only when we lower the cut-off level to as low as 0.2 per cent households. However, census data also shows that the number of urban districts where more than 0.2 per cent households were using solar energy for lighting has reduced considerably between 2001 and 2011. 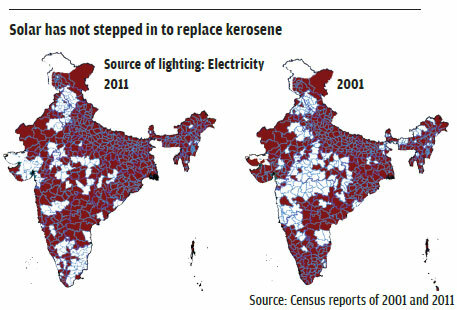 Solar energy has not been able to replace kerosene as the major source of lighting whether in rural or in urban areas. It needs to be analysed whether it is a cost issue, an access issue or a governance issue. There is some hope. The 2011 census data also shows that in 46 districts in the country more than two per cent households use solar energy as a source of electricity. Good article. What are needed for a vast country rural areas is decentralised power. 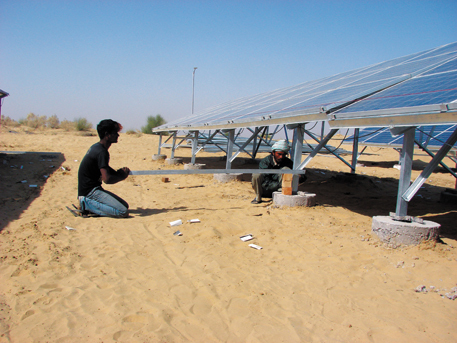 Solar Cookers with storage,simple solar driers,wind battery chargers,solar small energy systems,energy conservation,biogas/biofuel/biochar from care-free growth,regenerative CAM plants like Agave and Opuntia to be grown on a massive scale in millions of hectares of wastelands in India.Wind farm and solar co-operatives are to be promoted for mass scale involvement in Renewables.